For as long as Esmerine can remember, she has longed to join her older sister, Dosinia, as a siren–the highest calling a mermaid can have. When Dosinia runs away to the mainland, Esmerine is sent to retrieve her. Using magic to transform her tail into legs, she makes her way unsteadily to the capital city. There she comes upon a friend she hasn’t seen since childhood–a dashing young man named Alandare, who belongs to a winged race of people. As Esmerine and Alandare band together to search for Dosinia, they rekindle a friendship . . . and ignite the emotions for a love so great, it cannot be bound by sea, land, or air. Esmerine and her sister Dosinia are mermaids of merchant class turned Sirens, but both girls long to know more of the life above sea on land. As a child Esmerine had a taste of other worlds with her winged friend Alandare who flew in to bring her books and taught her to read. As a young adult she hasn’t heard from him in years. When Esmerine’s sister disappears she knows she must use the skills she refined on land to find Dosinia and bring her back home. In the vein of Hans Christian Anderson comes a fantasy tale of three worlds colliding- earth, sea and sky. Three distinct races of people who rarely intermix must learn about each other. I was torn because while I loved this book it felt like but a skeleton of what could have been extraordinary world building and I wanted much more. The other part of me savors the fact that it was short and old fashioned. I would recommend Between Sea and Sky to those seeking a childhood fairy tale with just the right amount of adventure and romance. Now that I’ve had a taste of Jaclyn Dolamore’s lush writing I am going to pick up Magic Under Glass. She’s a very talented young woman and I’ll be passing Between the Sea and Sky on to my daughters. You might also like: Secondhand Charm by Julie Berry, Forgive my Fins by Teralynn Childs and The Mermaid’s Mirror by L.K. Madigan. Content: Clean. Brief talk of breasts (since they are mermaids) and an innocent kiss. Recommended for ages 12 and up. 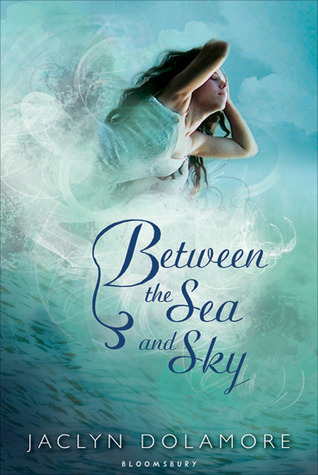 Enter to win your won copy of Between the Sea and Sky on Goodreads. Ends October 20, 2011.